The Minnesota Forecaster: Spring and Storms? With a forecast of 70 on April 1, there was hope that maybe, just maybe, spring was ready to take up some quality residence. Thunderstorm chances were also in the forecast, so there might be a little rockin' and rollin' on the horizon. No interest on Wednesday's weather I guess. The latest Euro may peek some interest for Monday-Tuesday, don't put the shovels away just yet! Well, I'm interested in today's weather. Forecast high is 75. Let's see how nice it gets! I burned off the rest of the gas in the snowblower yesterday and couldn't have been happier to do it. Spring is here. What???? What does the Euro say for Monday and Tuesday? I am not hearing any mention of it in the forecasts and discussions I read. Is this an April Fool's Day joke? Please share more before I can say Bring It!! PWL, you dont have to look too far. Just read/look at the NWS area forecast, there are varying chances of snow from Saturday night thru Tuesday night. Not sure if it will be measurable but it is in the forecast! 83 degrees at 5pm. New record! WOW....83° today reminds me of a weather pattern that occurred in April 05 or 06.....that year we hit a high of 91(which broke a record and was under forecasted by some 10-15 degrees like today)....then 6 days later we received 6.5" of snow. So we got the warmth....then the under forecasted high.....which broke the record.....and now theres snow in the 7 day. We'll see if it becomes measurable and history repeats itself. Many are calling for a super el nino this year, into the winter months. Hopefully another mild winter awaits us! There will be 'travel impact' map coming soon! Don't be shocked, and lulled into spring being here with yesterday's weather. Two steps forward and one step back, right. No travel impact map until next December and possibly well into 2016 if current prediction of a strong El-Nino winter are accurate. It will be a long while before a decent snowstorm will hit the core metro. The term "heavy snow" was used in this afternoons weather discussion for our CWA when talking about Thursday's night weather, just saying! Dr. Novak used the s-word today also in a tweet for Thursdays weather, of course with a question mark. Very dry week so far in light of the forecasts from Sunday night. I actually haven't seen a single drop here in Mpls. Woke up to wet concrete Monday morning, but the rain had since stopped. Since then, nothing. Kind of a bust? whether it's snow or rain, the pattern does not change. Models continue to overestimate precipitaiton amounts, and so do most forecaster who basically blindly follow what the models say. Actually the pattern has changed. Troughing in the west as opposed in the east will lead to several systems moving up into this direction. Also, discussions mentioned that these wouldn't be all day rains, but rains off and on through the day. There's a decent little slug of moisture moving up towards the metro as I type this. It even had a brief severe moment with it, due to hail. The next week or two will be more active than what we have seen so far, but the severe threat should stay mostly south of the area. Next week that certainly could change, depending on how this whole pattern transition plays out. The constant warmth may not show up until May, but since most are forecasting lower than normal precip for this coming summer it would be nice to get a bit of a head start on those rain totals. @Duane you could say the pattern changed but you would never know it if you live in the metro, another bust! I would agree withe the above anonymous whether its rain or snow it still largely misses the metro like your slug of moisture this afternoon. I'm just trying to understand why some people think of this as a bust. The heavier totals were supposed to be south and east of the metro area, and that is what happened. Parts of the cities did end up getting rain and the weather service didn't really call for a complete wash out. I don't live in the cities or get their TV stations so I don't know what individual forecasters had said. Were people expecting a ton of rain today, because I never even saw that forecast or read it in any of the discussions. Novak has a travel impact map out! And it does include the metro! When Novak speaks, I listen and I dance. Bring it, bring it, bring it!! It is always fun to get weird weather in Minnesota. 84 and then talk of accumulating snow. I am all ears and all bring its. Use common sense guys, not the models output which have been consistently wrong all winter. It will not snow in MSP. Period. I got snow in Lino lakes area for almost two hours already. No doubt in my mind that there will be a narrow (30 to 50 mile wide) band of accumulating snow across eastern MN & northern WI. Hell, I wouldn't be surprised if a chunk of no. WI measures 6"+ of heavy, wet concrete-like snow by sunrise FRI.
As usual, a ton of people will start talking BUST, even though it is being stressed that snowfall will be a narrow & thin band. The problem is that this band will set-up near and/or in the MSP metro. This is a no win situation for 4casters because it is irresponsible to NOT mention snow for tomorrow. BTW, the likelihood of any snow accumulating on roads/blacktops is low. Accumulations will be confined to grassy and/or elevated surfaces. Meanwhile, any snow that does accumulate will likely be gone by noon FRI.
Novak is correct a surprise snow will fall, but in Wisconsin. As usual the metro misses out AGAIN! Awesome job Novak, you called the change over....even for the metro. After over 90 minutes of snow it's raining now. There was a thick layer of slush on paved surfaces before the rain restarted. The radar I was watching didn't show the snow for 75 minutes. By the way: I finally figure out how to post from Apple devices. Load Google chrome and use that. decent snow showers in the west metro this morning! 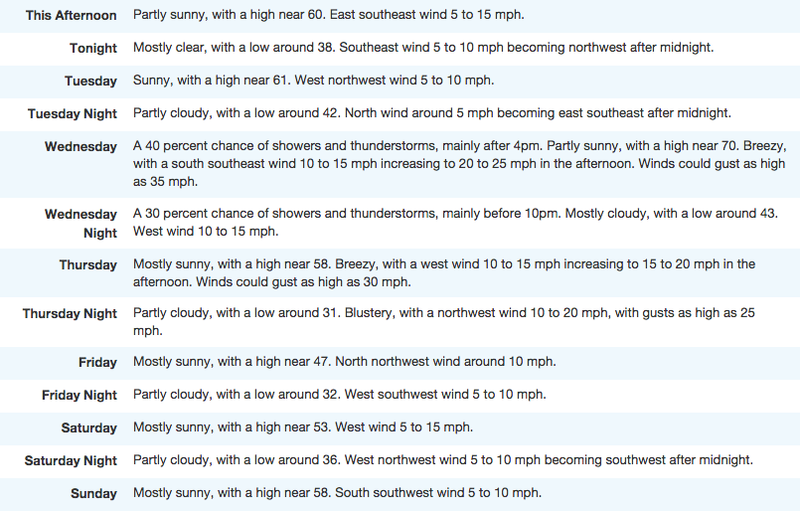 Place your bets now on whether we get anywhere near the forecast high of 52. 53 degrees at Flying Cloud Arpt now! Didn't take long once the sun came out for temps to warm up nicely. A nice preview for this weekend. If we would have been stuck all day in solid cloud cover, then it probably would have been a bust in temps, but they actually exceeded the forecast high for today. Nothing wrong with that at all. Never underestimate the power of a yellow dwarf star colloquially known as the Sun. My favorite kind of snow: beautiful big flakes that melt immediately on contact. I'd take this snow any day - even in April! NWS says snow COULD return next week, really its in their AM discussion. Next week will turn sharply colder as compared to this week.We have been hitting the low 70's most days this week...come Monday and most of next week it will be hard pressed to crack 50...with a few days stuck in the 40's....with some snow showers/flurries around time to time but no acculamations .I wouldnt classify it as winter but definitely not April weather compared to average. WOW, looks like a cold week compared to average. Damn Minnesota weather, make up your mind! We always talk about bust in the winter, but hardly mention it when it comes to rain. So all the talk was about a rainy Saturday night and Sunday with .50-1" rains expected. As of midnight only .07 has fallen and the rain has moved north and east of MSP with the radar not showing much. But yet a Paul Huttner tweet this morning says "Sunday Soaker with 1/2" to 1" likely", really? @Sam, 7am update is not much more, .18 of rain at MSP. And yes I saw that tweet from Paul Huttner, its way off base, NWS has even trimmed precip chances today and just like in winter the dreaded dry slot has come to fruition. Question is why cant meteorologists ever see this dry slotting when forecasting, seems like its always after the fact. As late as last night's forecast from the NWS it was still calling for 1/2"-1" rains. BUST! It is getting ridiculous. This tendency to overestimate precipitation should be really looked into. Either there is something dramatically wrong with models, or with the competence of forecaster. Probably a bit of both. But overestimating amounts by more than 5 times one day out, is really alarming. Especially when the NWS busts so big. I never considered Huttner particularly competent, so I am less surprised, but the NWS? aren't they supposed to be the real expert? Agreed, very bad forecast for today. I was sort of looking forward to an all-day rain. Saturday/Sunday rains totaled .21" of rain at MSP. Horrible forecast by many, including NWS and Paul Huttner Sunday soaker, not even close buddy, fail. When your region is located directly under the Jet Stream (esp. the jet streak), it is often likely that you will get "dry slotted". This is the area where precipitation is often over-estimated. This was overlooked by many forecasters during this event & obviously not depicted well by model data. especially by Paul "Sunday Soaker" Huttner. "Will there be snow? Or will there be highs in the 90s? Stay tuned!" Another day where rain was forecasted by many and very very very little fell in the metro, if any at all in most places. Either snow or rain, hail or sleet it doesnt matter the forecast for precip hardly pans out. Sometimes it just don't happen according to forecast. Looking at next weekend, the first weekend of May, there are some indications that we may be entering a pattern change. By Saturday morning the ECMWF and its ensemble members, the Gem and it's ensemble members, and the GFS ensemble members are all showing a strong signal for a west coast trough setting up with ridging approaching us. The only thing lacking is the GFS operational which insists a west coast ridge we be prevalent. By Sunday the ECMWF and its ensembles and the GEM ensembles both hint that the ridge axis will be setting up over the Great lakes area, whereas the GEM operational and the GFS ensembles show a flatter flow. The real outlier here is the GFS operational that shows trough dropping out of Canada setting over the Great Lakes. Although the signals are mixed I do like riding the ECMWF and it's ensemble mean along with the Gem ensemble mean. Therefore I think the chances are about 6 out of 10 that we could get some return flow of the gulf with dew points approaching 60° for next weekend, with thunder storms late in the weekend into early next week. Lets see if the Euro signal will still be there as we get into the 5 day period. I'm liking the Severe Wx set-up for late SAT into SUN. Hardly a drop in S. Mpls. Cells just split right around us. Plenty of nickel-sized hail in Roseville. The storm blew thru pretty quick though. This event was very hard to forecast, the SPC didn't put out a watch box, although they did mention in a Meso Discussion that the chance of a watch was listed at 40%. I was at work and therefore couldn't post anything as most sites are blocked and I don't have a smart phone. I can however get the radar from NOAA, and the SPC site. I checked the Meso Analysis page at 1pm and noticed that the cold front had slowed down and nearly stalled for a time, it hadn't moved hardly at all from its position at 945am when I left for work. The observed sounding for MPX this morning showed a rather stout capping inversion in place, and with the frontal passage by most models taking place around 1-2pm I highly doubted that the cap would break as the front approached. That all changed when I noticed that the cold front was just north of St Cloud at 1pm and I thought there was a good chance the cap would weaken as it would finally approach the metro. A small caveat here, I work at Northtown Mall and did send one employee home at 415 so they could get home before the northern storm could get there. Kudos to Tom Novak of Novak Weather. On his facebook page he was beating the drum the last couple of days for severe chances including the Metro. Nice job Tom!! I find it strange that the most significant severe weather event to hit the MSP metro in the last few years did NOT have a Watch issued with it from the SPC. Think about this, I believe there were at least 10+ warnings issued for MN/IA/WI yesterday. Plus, The SPC had more than enough atmospheric data AND surface reports of significant severe weather to pull the trigger. Either the SPC screwed this one up or the NWS local offices are smoking crack. I will blame this one on the SPC...someone was asleep at the wheel. Did I see that correctly?....NWS mentions snow, really?..in their cwa discussion...siting the euro model....no way right! @bigdaddy, your not seeing things, NWS again mentions the potential for snow in their discussion yet again this morning. Brings up a question, what is the lastest measurable snowfall in MSP or for that matter MN? What happened to the "locally heavy rainfall" for this evening? I've had a few drops of rain all week here in Mpls. The Sunday rain split right around us, as did last night's. Still very dry out there. Today looks like it might be the same. Drought busting? Certainly not yet. Snow in the discussion again, for Monday night. Will it happen? Be aware of Sunday evening south of the metro. Dew points near 60° are possible and with the low pressure center near Sioux Falls wind fields would be supportive of all types of severe. Those areas that see sun shine for a couple of hours will be under the gun. Snow coming for some parts of Minnesota as well. thats a bigger story being that its the second week of May! Severe chances increase as we head into the weekend, and the SPC finally put Minnesota into the risk area for Saturday. I'm very interested to see how this plays out. Typically with a warm front nearby the area, and storms that form and cross the warm front will have that potential to spin up some severe weather. There is still some doubt as to how everything will play out, and given we are still several days away, the doubts are fully expected. I guess the biggest thing we should be aware of is the fact that a potent storm system will approach the area on Friday night/Saturday via a warm front, then pass by with a cold front on Sunday afternoon. Each of them will carry a severe risk, especially Sunday if we can clear out any left over clouds from the stuff overnight on Saturday. Those risks will drop a lot if we don't get much sun. Conditions look favorable for severe wx, so keep an eye to the sky if you have any outdoor plans on Saturday or Sunday. Monday will be nice and COLD! 40's, love it. Duane brought it up in this thread, but I have been watching this weekend closely. I agree with Tom Novak over at Novak Weather that Sunday PM is the best chance for severe here in the metro. I have heard other media outlets say that the best threat for severe will be during the early afternoon, after that not so much. I disagree as the surface low is not progged to move through until late in the afternoon. If the metro gets good sun between 1PM and 4PM on Sunday than all bets off. SPC downgraded us to SLGT. As Novak said, I'm smelling bust. Novak speaks out of both sides of his mouth, yes he said bust potential and also said severe weather likely, used the word impressive a few days ago. Hes just covering all angles, weather is never accurate or precise, mother nature will do what mother nature wants to do. And Novak updated his outlook today. That's what meteorologists do. At any rate, this was an enormous bust, and Novak called it. Anybody know how much rain MSP has gotten these past 3-4 days. Many were calling for 2-3 inches. I don't think that panned out did it? I'm close to the airport and I'd say we'd be luck to have gotten a half inch total. BUST. Dought busting rains? Um, no. Definitely not. Not even close. Agreed, .50" at best for MSP over the weekend. No not drought busting, also snow falling over parts of Minnesota currently. Paul Douglas said in his Star Tribune column that today would not be a washout. He was so wrong. With his inability to forecast short term weather are we really supposed to believe his global warning panic. Especially when we know that that is how he makes his living and he has all the things that contribute to global warming. SUV, lake cabin. Private plane, boats, snowmobiles and etc. we should all cut back, just not him. What a fraud. Summer takes firm hold next week with a string of 80s according to the European Centre for Medium-Range Weather Forecasts model. THERE REMAINS NO REAL WARM WEATHER IN TERMS OF HIGHS IN THE 80S OR EVEN 90S BASED ON THE UPPER FLOW AND MEAN ENSEMBLES 50H HEIGHTS PAST THE MIDDLE OF NEXT WEEK. More or less the exact opposite on one another. Was it my imagination or didn't we just hit 92 degrees at MSP Tuesday? Temps at 99 (near 100) in western Minnesota? Looks like Huttner was right on the notion of 90 degree heat. June is running warmer than average last time I checked. Sounds like the kind of ridiculous forecasting I can use. As C.J. has reported over at the Star Tribune, Patrick Hammer has accepted a position out in Buffalo NY with a weather station there. While C.J. didn't mention the call letters of the station Patrick said, and I quote, “Kevin O’Connell is retiring, and I’ll take his position whenever he decides to retire.” So that lead me to a goggle search of Kevin O'Connell in Buffalo. The results show that Mr O'Connell is the chief weather anchor at station WGRZ, meaning that Patrick will become the Chief Meteorologist at that station. Congrats to Patrick. Personally I thought he was one of the better forecaster's in the Twin Cities market and was excited to see him in his temporary position at KARE 11. I just wished he could have gotten a full time gig with KARE and eventually moved the Chief Meteorologist spot when Belinda retired. Alas we lose another talent here in the metro. PS....A replay to my own post. Patrick is now at a station that will challenge every meteorologist's capabilities when it comes to snowfall forecasting, both synoptic and lake effect. While I've remained silent about the heavy rains that are expected to impact Minnesota through Friday morning, I have always doubted those models that showed the heaviest bands over the metro area. Almost all models showed a surface high pressure over the central Great Lakes area. When high pressure center sets up it means its winds are clockwise and as those winds reach the metro area they are out of the east ushering in dryer air, It will take the system coming in from the southwest quite sometime to over come that effect. This will cause the heavier bands to set up south and east of the metro. I would not be surprised to see the heavier bands get as for north as the Cannon Falls area, but I think they should remain south and east of line from Albert Lea to Faribault to Red Wing.